It is rumored from past few weeks that Sony is going to launch the successor of this year’s Xperia XZ1 at the MWC which is happening next year in February. There will be four different variants of the phone for different markets and the model numbers are H8216, H8266, H8296, and H8276. Yesterday, the Sony H8266 was spotted on Geekbench that revealed its specifications like Snapdragon 845 processor, 4GB RAM, and Android Oreo. 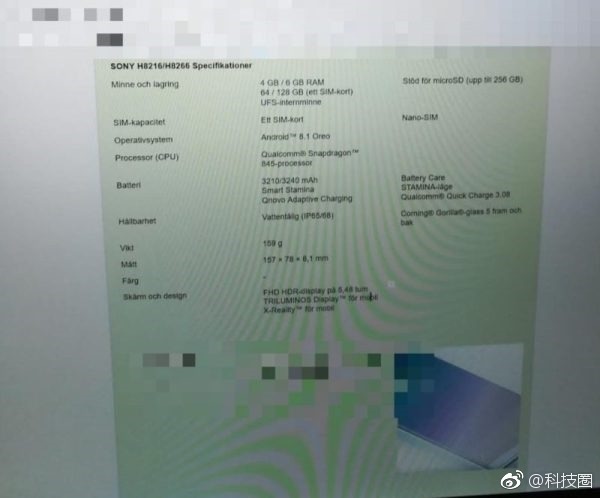 Today, some of the specifications of the Sony H8216/H8266 have leaked once again, this time via Weibo. So, as per the specifications listed in the image above, the phone will feature a 5.48-inch Full-HD HDR Triluminos Display with Corning Gorilla Glass 5 protection. The Sony H8216 will come with 4GB RAM and 64GB internal storage while the memory configuration of the Sony H8266 is going to be 6GB RAM & 128GB ROM. Also, the memory will be expandable up to 256GB via external microSD card. The battery sizes are going to be different too – 3,210mAh for Sony H8216 & 3,240mAH for the Sony H8266. Both will have Qualcomm Quick Charge 3.0 support. Looking at the dimensions – 157 x 78 x 8.1mm, it doesn’t look like that the phone will have an 18:9 display. So, it confirms the previous details that suggested the 16:9 display for the phone. What is your take on this? Do let us know via the comments section.